What is the value of a colouring kit for your child on his/her way to the hospital in an ambulance? Distraction techniques are very effective. This is common knowledge in many pediatric hospitals. Distraction is often used with children who need to go through a painful and stressful procedure. If the experience is turned into a positive one through distraction, your child will learn that it is possible to undergo a medical procedure in a calm way. This will help him/her gain confidence and give your child a feeling of control when he/she has to go through other procedures. We recommend a “Treasure Box” as a very useful distraction tool. Why is a Treasure Box effective as a distraction tool? Decreases your child’s level of stress and anxiety by allowing him/her to have a sense of control. This can help make for a successful medical procedure. Establish a relationship with your child that will put him/her at ease. Decide with your child what type of distraction tool will help him/her get over hurdles. Explain the procedure your child will be undergoing clearly, in age-appropriate terms and at his/her level of understanding. While explaining to your child, you should focus on the senses, such as cold and hot. Also, what he/she has to do to help everything go smoothly (example: don’t move, breath out gently). For a child under 6 years old, the choice of two to three distraction tools is enough. Any more than this may confuse your child. For a child over 6 years old, let him/her choose the items. 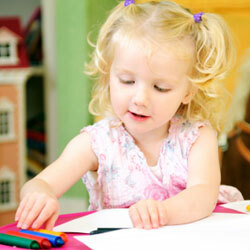 If it is possible, let your child play with the distraction tools for a few minutes before and after the procedure. It is important to constantly compliment your child for his/her efforts throughout all procedures. What other distraction techniques can be used? It doesn’t have to be magic to help make a difference!